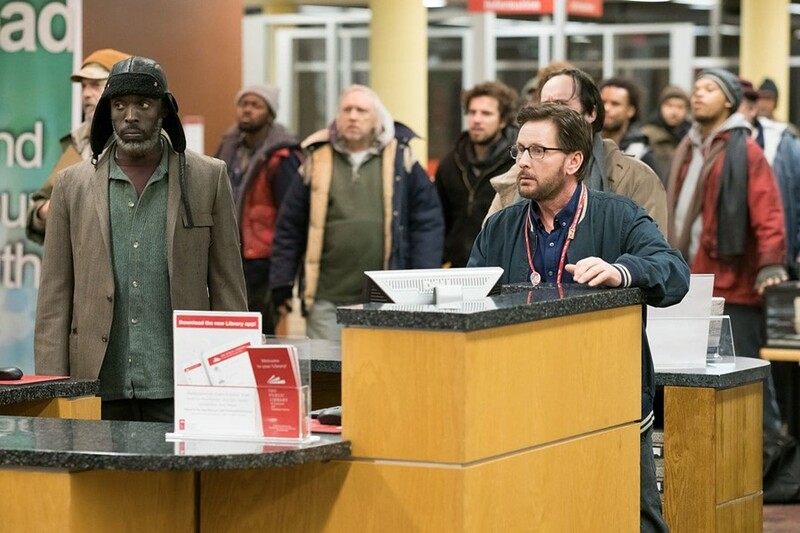 PHOTO COURTESY GREENWICH ENTERTAINMENT Michael Kenneth Williams and Emilio Estevez in "The Public." In the excellent, sprawling documentary about the New York Public Library, "Ex Libris," filmmaker Frederick Wiseman examined the vital cultural role of libraries, showing them to be so much more than free sources of knowledge. From administrative meetings, to book clubs, lectures, and community meetings, Wiseman turned his camera on employees, patrons, scholars, and the people who depend on libraries every day. Scene by scene, he built the case that these institutions are the very lifeblood of an educated society. One intriguing issue that film touched on only briefly was the question of how library employees should humanely and compassionately respond to homeless visitors. The real-life workers seen in "Ex Libris" had no perfect answer, and make efforts to welcome these individuals, but only up to a point. That same question is at the heart of Emilio Estevez's "The Public," an old-fashioned, heart-on-its-sleeve social advocacy drama that finds the actor returning to the director's chair for the first time in eight years. In addition to writing, directing, and producing, Estevez also stars as Stuart Goodson, head librarian at the downtown Cincinnati Public Library. Goodson and the rest of the staff have a friendly but at times uneasy relationship with the individuals who frequent their library. The building acts as a place for them to stay during the day and get out of the cold for a while, and that's fine, so long as their presence didn't infringe on the safety or comfort of the library's other patrons. But as the city braces itself for a bitter cold snap, a group of homeless people (led by Michael Kenneth Williams) decide to occupy the building after closing hours, refusing to leave because the shelters are full and they may very well freeze to death if forced to remain outside. The police are called, and the situation quickly spirals into a media and political maelstrom, drawing in a police crisis negotiator (Alec Baldwin), a district attorney and mayoral candidate (Christian Slater), the chief of police (Richard T. Jones), and the library's director (Jeffrey Wright). Estevez is strongest in setting up the film's world, establishing daily operations of the library and people in it. But as the conflict develops, things take a turn for the melodramatic. And by centering the film's moral quandary on Stuart (and his colleague, played by Jena Malone) the story ends up taking the form of a white savior narrative. The film's large ensemble cast (which also includes Taylor Schilling as a burgeoning romantic interest for Estevez's character) leads to a few too many underdeveloped plot strands. The less said about a morally bankrupt TV news reporter (Gabrielle Union) looking to mine the standoff for her own professional gain, the better. But for the most part Estevez does well, adding complexity and heart to the story he wishes to tell. And the central debate is a fascinating one: What is a library that can't serve the most basic needs of its patrons, and what are the limits of its obligation to its patrons? Despite any narrative shortcomings, "The Public" succeeds through an appealing earnestness and sincerity, building a thoughtful, compassionate drama that seeks to challenge its audience as much as it entertains.